Learn how to play The Ancient Kithara! on How to Play an Ancient Greek Kithara! This series of online lessons was prepared by Michael Levy for Luthieros Workshop, using our 9strings version of the “Kithara of the Golden Age”. This is the first in a series of ‘online kithara lessons’, demonstrating how to use the ancient kithara playing technique of ‘string blocking’ (dampening specific strings to strum open chords), which I used to accompany the vocal lines in the first track of my new album to feature the Luthieros replica kithara, named Odysseus and the Sirens. 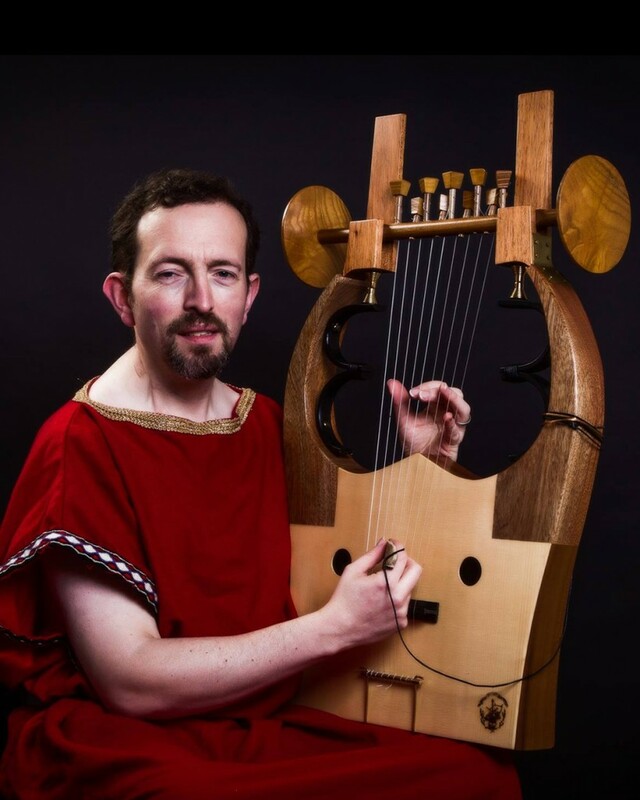 This video demonstrates how by a simple re-tuning of just 2 strings on this wonderful 9-string replica of the ancient Greek Kithara of Classical antiquity, it is possible to play all of the ancient Greek musical modes…. “With holy voice I call the stars [Astron] on high, pure sacred lights and genii of the sky. This video demonstrates how to tune the kithara to the ancient Greek Hypophrygian Mode in just intonation, in preparation for learning the 2000 year old “Epitaph of Seikilos” in the next few lessons..
“I will sing of Heracles, the son of Zeus and much the mightiest of men on earth. Alcmena bare him in Thebes, the city of lovely dances, when the dark-clouded Son of Cronos had lain with her. Once he used to wander over unmeasured tracts of land and sea at the bidding of King Eurystheus, and himself did many deeds of violence and endured many; but now he lives happily in the glorious home of snowy Olympus, and has neat-ankled Hebe for his wife. This video demonstrates how to accompany the famous ancient Greek song, “Epitaph of Seikilos” on the kithara – discovered inscribed in the alphabetical musical notation of ancient Greece on an ancient Greek burial stone, this 2000 year old song is the only complete piece of music to have survived from antiquity. This final video in this series demonstrates a wide range of possible improvisatory techniques which can be applied to a solo performance of the famous 2000 year old ancient Greek song, “Epitaph of Seikilos” – discovered inscribed in the alphabetical musical notation of ancient Greece on an ancient Greek burial stone, this 2000 year old song is the only complete piece of music to have survived from antiquity.